Inferior vena cava thrombosis is a rare occurrence after an orthotopic liver transplant that is associated with a high rate of retransplant and mortality. There is no consensus regarding the optimal therapeutic strategy. Surgical management, including thrombectomy with revision of the cavocaval anastomosis, has been described. With the use of endovascular therapies, several minimally invasive approaches are available that are effective and avoid the high morbidity associated with reoperative surgery. We describe our successful experience using an approach after a liver transplant in which the inferior vena cava thrombosis in a patient presenting with acute renal failure, anorexia, weight loss, and fatigue using an ultrasound-accelerated, catheter-directed thrombolysis platform in conjunction with systemic anticoagulation. Inferior vena cava (IVC) complications occur in 1.8% of orthotopic liver transplants. Despite this occurrence, 29.4% of patients with caval complications are ultimately in need of a retransplant, while others die.1 Nevertheless, there exists a paucity of data in the literature regarding management of inferior vena cava thrombosis. Several different therapeutic strategies have been proposed, but there is no consensus regarding the most successful approach. Surgical interventions including a thrombectomy of the inferior vena cava and revision of the cavocaval anastomosis have been described.2 With interest in endovascular techniques, newer, less-invasive techniques have become available, and have been successfully adopted. In this case, we describe an approach to manage inferior vena cava thrombus after an orthotopic liver transplant by using ultrasound-accelerated, catheter-directed thrombolysis in conjunction with systemic anticoagulation. A 55-year-old man underwent an orthotopic liver transplant for end-stage liver disease secondary to alcohol abuse and hepatitis C. Additionally, he had a 3-cm hepatocellular carcinoma in the right lobe of the liver that was treated 1 year before his transplant with transarterial chemoembolization. His Model for End-Stage Liver Disease score at the time of the transplant was 13. The cavocaval anastomosis between the donor and recipient was performed with a side-to-side cavotomy. After surgery, he underwent an induction immunosuppression regimen consisting of basiliximab and a rapid steroid taper. He was transitioned to a maintenance regimen consisting of mycophenolic acid and tacrolimus, and the patient was discharged 5 days after surgery. He appeared to us again 3 weeks after his transplant with acute renal failure, fatigue, anorexia, and weight loss of 20 pounds. The results of his vital signs and a physical examination were unremarkable. His serum creatinine was elevated at 161.7 μmol/L (1.83 mg/dL); however, results of his liver enzymes and bilirubin were within the normal ranges. A computed tomography of the abdomen/pelvis (Figures 1A and 1B) was taken, which revealed an acute thrombus in the IVC, extending from the renal veins to the cavocaval anastomosis. Also, there was thrombus in the right common iliac vein. Initially, he was started on systemic intravenous heparin, with ongoing adjustments toward a goal of attaining a partial thromboplastin time of 65 to 89 seconds. As his signs did not improve, mechanical thrombolysis was performed of the caval thrombus 26 days after surgery. After venous access of the left common femoral vein, digital subtraction venography was performed of the IVC with contrast (Figure 1C). The cavagram confirmed the partially occluded IVC thrombus, extending from the renal veins to the cavocaval anastomosis. The thrombosed segment of the IVC was navigated using a 1-mm (0.035-inch) Guidewire (Terumo Corporation, Shibuya-ku, Tokyo, Japan) and 1.67-mm (5-French) Glide catheter (Terumo Corporation). Ultrasound-accelerated, catheter-directed thrombolysis then was initiated using the EKOS EndoWave Infusion Catheter System (EKOS Corporation, Bothell, WA, USA), which combines high-frequency, low-power ultrasound energy, with targeted drug delivery for mechanical and chemical thrombolysis. The 1.73-mm (5.2-French) multilumen EkoSonic Intelligent Drug Delivery Catheter and matching ultrasound coaxial core wires were positioned over a 1-mm (0.035-inch) guide wire across the length of the target clot, extending from the renal veins to the cavocaval anastomosis, using fluoroscopic guidance. The guide wire then was removed and replaced with the microsonic core, containing a series of ultrasound transducer elements (2 MHz, 0.45 W) distributed approximately 1.0 cm apart, along the leading tip, to deliver uniform ultrasonic energy radially, along the coaxial infusion zone. After priming the drug lumens of the catheter with heparin (1000 IU), a continuous infusion of tPA was initiated through the side-hole delivery infusion catheter, at a rate of 1 mg/h overnight. Simultaneously, normal saline was infused as a coolant, through the central lumen of the catheter, at a rate of 35 mL/h. Additionally, continuous intravenous infusion of heparin was administered via the introducer sheath, at a rate of 500 U/h. Fibrinogen levels, international normalized ratio, and partial thromboplastin time were routinely measured throughout the duration of thrombolytic therapy. A repeat venogram 24 hours later (Figure 1D) revealed partial clot lysis, with a residual thrombus. Therefore, continued thrombolysis was administered for an additional 24 hours, with tPA infusion at 1 mg/h, and systemic heparinization at 5 U/kg. An infrarenal IVC filter also was placed, given the fact that there was a right common iliac deep vein thrombosis. Given the patient’s liver transplant, an infrarenal IVC filter was placed so as to not interfere with the cavocaval anastomosis. The final venogram 2 days after the initiation of tPA confirmed the complete resolution of the clot (> 90% lysis) and restored caval patency (Figure 1E); therefore, thrombolysis was terminated, and the EKOS delivery system was removed. Mild stenosis of the suprahepatic IVC was apparent on the final venogram. The patient’s postprocedure course was unevent-ful. He was maintained on systemic anticoagulation with heparin and transitioned to warfarin. The duration of systemic anticoagulation is 6 months with an international normalized ratio goal of 2.0 to 3.0. His creatinine normalized after the procedure (95.5 μmol/L), and he was discharged 5 days after we ceased the thrombolytic therapy. The patient had no major hemorrhagic events or other complications. The results of a repeat abdominal ultrasound 6 months later were normal, with no IVC abnormalities or thrombus noted. Inferior vena cava complications are rare after orthotopic liver transplant, as evidenced by a series of 911 patients, in which only 17 patients had some degree of IVC stenosis.1 Furthermore, IVC thrombosis was identified in only 1 of those 17 patients as the underlying cause of IVC occlusion. The remainder of patients with IVC stenosis were related to technical factors, reoccurrence of Budd-Chiari syndrome, or an unidentified cause. Symptomatic patients of IVC complications often present with abdominal pain, ascites, weight gain, lower extremity edema, renal failure, elevated results on their liver function tests and graft dysfunction, pleural effusion, and/or pulmonary embolism.5,6 Rarely, do patients have fatigue and weight loss, associated with protein losing enteropathy. 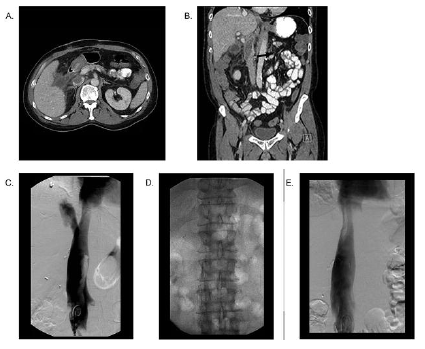 Renal failure was the predominant manifestation of IVC thrombosis in this case, possibly owing to impaired renal outflow from clot extension adjacent to the renal veins. This suspicion is supported after thrombolysis therapy as the creatinine swiftly normalized. Early stenosis (< 1 month after transplant) is often attributed to technical related factors at the time of surgery (such as a tight anastomosis, twisting of the vena caval anastomosis, or donor-recipient size mismatch).7 In contrast, late stenosis is often attributed to intimal hyperplasia and perivascular fibrosis.7 Our case is consistent with early stenosis after surgery, and likely, it was the result of extrinsic compression of the IVC from the graft leading to venous stasis and subsequent thrombus formation. This theory is further supported by the mild IVC stenosis seen after complete thrombolysis, suggesting partial extravascular impingement on the vessel. Moreover, deficiency of coagulation inhibitors after transplant (such as protein C, protein S, and antithrombin III) predispose patients to a relatively hypercoagulable state, which may further exacerbate the problem in the setting of a stenosis.8 Stenting of any residual stenosis and lysis of the lower extremity deep vein thrombosis were not pursued because of the patient’s condition, which necessitated future anticoagulation, and a desire to direct the tPA dosage to the partially thrombosed IVC. This case report demonstrates the safe and effective use of ultrasound-accelerated, catheter-directed thrombolysis, along with systemic heparinization to resolve an IVC thrombosis after a liver transplant. The strategy avoids the need to re-enter the peritoneum after recent surgical intervention, thereby potentially avoiding the high sickness and death, which are associated with reoperative surgical interventions. Although this method is an attractive alternative, it does carry an inherent risk of bleeding associated with the thrombolytic agent.3 The favorable result seen in this case for managing posttransplant IVC thrombosis demands further investigation, as it represents a tactful approach to a potentially devastating problem. Settmacher U, Nüssler NC, Glanemann M. Venous complications after orthotopic liver transplantation. Clin Transplant. 2000;14(3):235-241. Bertani H, Pinna AD, Di Benedetto F, Quintini C, Miller C, Villa E. Hepatic allograft salvage with early doppler ultrasound diagnosis of acute vena cava thrombosis. Abdom Imaging. 2004;29(5):606-608. Mindikoglu AL, Miller JS, Borge MA, Van Thiel DH. Post-transplant IVC occlusion and thrombosis treated with tPA, heparin, and sharp recanalization. J Gastroenterol. 2005;40(3):302-305. Baccin CE, Haskal ZJ. Power-pulse thrombolysis and stent recanalization for acute post-liver transplant iliocaval venous thrombosis. Cardiovasc Intervent Radiol. 2008;31(Suppl 2):S166-S170. Glanemann M, Settmacher U, Stange B, et al. Caval complications after orthotopic liver transplantation. Transplant Proc. 2000;32(3):539-540. Nishida S, Vaidya A, Franco E, et al. Donor intracaval thrombus formation and pulmonary embolism after simultaneous piggyback liver transplantation and aortic valve replacement. Clin Transplant. 2003;17(5):465-468. Kim CY, Kim DS, Um SH, et al. Concurrent inferior vena cava and hepatic vein stenoses after orthotopic liver transplantation: a case report. Transplant Proc. 2011;43(6):2421-2423. Gastaca M, Valdivieso A, Ruiz P, Gonzalez J, Ventoso A, de Urbina JO. Venous outflow obstruction after orthotopic liver transplantation: use of a breast implant to maintain graft position. Clin Transplant. 2011;25(3):E320-E326. Quintela J, Fernández C, Aguirrezabalaga J, et al. Early venous outflow obstruction after liver transplantation and treatment with cavo-cavostomy. Transplant Proc. 2009;41(6):2450-2452. Grommes J, Strijkers R, Greiner A, Mahnken AH, Wittens CH. Safety and feasibility of ultrasound-accelerated catheter-directed thrombolysis in deep vein thrombosis. Eur J Vasc Endovasc Surg. 2011;41(4):526-532. Acknowledgements: The authors have no conflicts of interest to declare, nor was there any funding for the study.